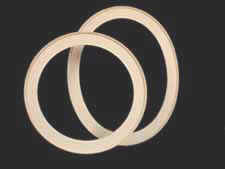 The "Natural Fiber Round and Oval Canvas Stretchers" are one inch thick. The Stretcher Bar is made of double refined natural wood fibers. The canvas stretcher is cut from one continuous piece and it has no seams or joints. The wooden canvas stretchers are extremely sturdy and light in weight. The stretchers will not warp or twist as the artist stretches their canvas making it the perfect support for stretching canvas for round and oval paintings. Art Boards™ also makes custom size canvas stretchers. Art Boards™ Art Storage System. How to store paintings on canvas stretchers. 100% Guaranteed Satisfaction or full refund on All Canvas Stretchers Ordered.